In that there Woodbridge, there are certain retail institutions, much like Jack's in Ipswich. One such is the bread shop on the Thoroughfare, properly known these days as The Cake Shop Bakery. They supply Lux Farm among many others. Even though it broke the first rule of Light Lunch -- must have at least one table -- we did a cut and run trip there way back before weirdness ensued outside Costa. Next to Woolies. Ah. As elongated as TCSB is, it never quite stretched to the end of Jenny's block. Next door at 21A was Splash, purveyor of rubber ducks and misc bathroom oddments. Not no more, it ain't. Splash is sunk and the TCSB barons have only gone and opened their own cafe. Despite having nothing to do with Ghostbusters, it's called The Firestation. 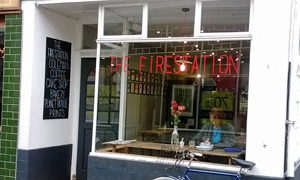 A nod to the indisputably more firestation-y Cafe Bencotto? Meet you there, I said. But -- and this is clever -- there's no meat there. Hello, Museum St Cafe. I didn't see any blatant "we're veggie" flashing neon but that seemed to be the message. That's fine. We're grown-ups. Everything edible is displayed on the counter and it looks mighty good. I order what they're having, which turns out to be "homity pie", apparently a trad British open pie made with spuds, onions and leeks. Salad on the side, please. Seated on rustic benches, our plates o' goodness arrive, bedecked with colour. We're reminded of the lamented Butley Barn, a joyous outing where we didn't quite know what we were eating but it was darn tasty. Same here, except that Mrs Andy is able to point out the red quinoa and oversized couscous. Tangy blood orange San Pellegrino to wash it down. Eclectic yumminess, ahoy. Place has a feel all of its own with some comfy chairs, Planet Patrol prints adoring the walls, inc. Sgt Pepper and Sendak images, and a decent selection of mags, inc. the Indy, The Stage and Private Eye. Enough with the filler: let's do cake. Point and choose. Treacle tart and a top-notch macchiato set me up rather nicely for the weekend. It's good. It's very good. If it was a car -- Nissan Leaf. If they were passing by -- Meg Rosoff.